Whoop! Whoop! 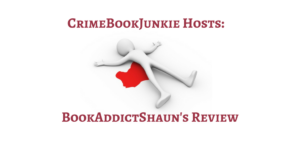 Guest reviewer, #BookAddictShaun is back with his thoughts on Tim Weaver’s YOU WERE GONE. I’ll share some ‘deets’ about the book and then let’s see what Shaun thinks! She has no phone and no ID, just a piece of paper that reads ‘David Raker’. She says she’s his wife. Wow. What an absolutely twisted read. You Were Gone is the ninth David Raker story and sometimes an author can begin to waver a little when they have written about the same character for so long. Tim Weaver is not one of those authors. 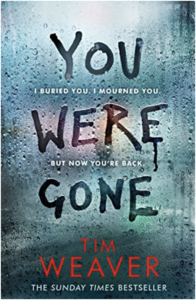 If only for the emotional response this story drew from me, You Were Gone might be Tim’s best book yet. In not wanting to give away too much of the plot, I will say nothing other than that everything we know and understand about Raker from the past eight books has stemmed from the death of his beloved wife, Derryn. Had she not have passed, there wouldn’t be a Raker that felt compelled to find as many missing people as he could. There wouldn’t be a Raker that kept putting his own life in danger time and time again. How then would Raker react if he was told a woman had turned up at a police station claiming to be his dead wife Derryn? That is the basis for You Were Gone and all I will say about the plot is it is first class. Stunning. A real masterclass in how to write a truly thrilling and unforgettable mystery. You Were Gone could be read as a stand-alone but I feel the interaction I had with it and how it affected me emotionally was because of how much I feel like I know Raker. His emotions throughout this story are palpable, from seeing his supposed dead wife in the police station to everything else that followed. Tim writes in a way that meant I was completely engrossed in this story, feeling everything that happened and standing alongside Raker as an invisible bystander. Raker’s confusion and pain is clear to see and as the story progresses I just had no idea how things would ultimately end and I couldn’t read quick enough to find out. It’s sometimes hard to talk about a story when so much of what you enjoyed centres around the incredibly intricate and twisted plot, and that is the case here with You Were Gone. I was so invested in this story that by the end of it I felt like I’d been put through the wringer alongside Raker. The ending was nothing short of perfect and even almost made tears fall it was that good. This story had everything going for it and it isn’t one that I am going to be forgetting in a hurry. It’s a hugely chilling read with some powerful writing and storytelling that further cements my love for Tim Weaver’s books and means that once again I must now recommend them to anybody who will listen. Sometimes the best thing you can say in a review is READ IT. So go and get this book, read it and I guarantee that you too will be blown away by this unforgettable story. Wowsers! I’m sold! After reading this review, I just had to add You Were Gone to my ginormous TBR pile… sounds like an awesome read! Thanks for sharing, Shaun! Pop back next Sunday when Shaun will be telling us what he thought of Steve Cavanagh’s THIRTEEN! Can’t wait! This entry was posted in Book Reviews, Guest Reviews and tagged #Crime #Twists #Murder, #CrimeFiction, #CrimeThriller, #GuestReview, #Series, #Suspense, #Thriller, #Twists by crimebookjunkie. Bookmark the permalink.